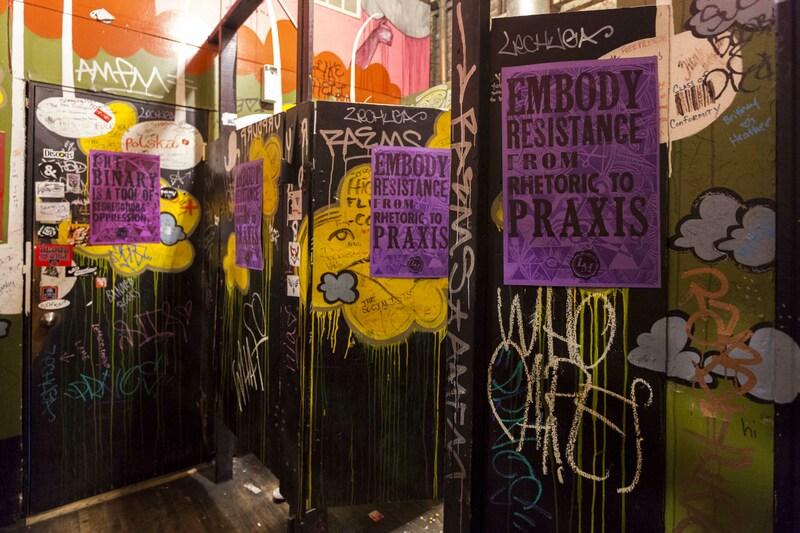 Sprawled across grungy bathroom stalls in Chicago bars, beside advertisements and random phone numbers, colorful, hand-printed printed posters read: “We Are Many” and “U Me She Want Equal Rights & Status.” The letterpress posters are the careful and creative work of artist and LGBTQ activist, Angela Davis Fegan, who is using the public restroom as a space to talk about queer issues, intersectionality, and feminism. 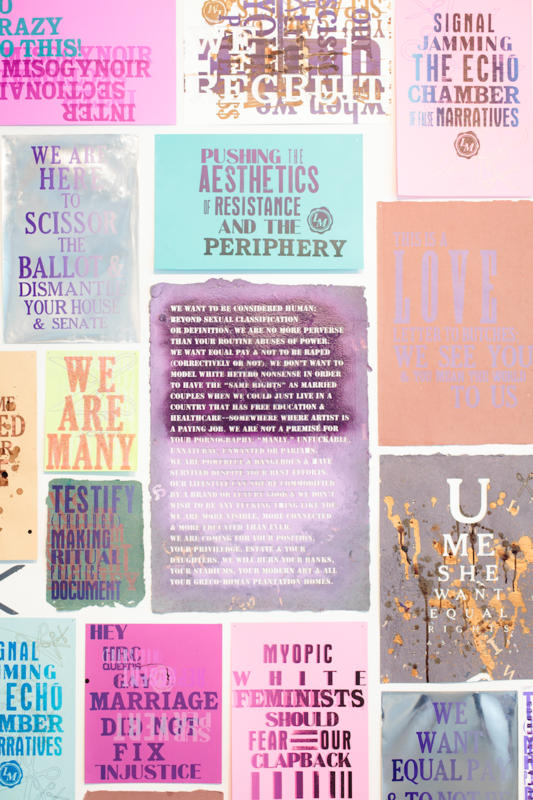 The project, dubbed the Lavender Menace Poster Project, is a reference to the phrase that Betty Friedan — former president of the National Organization for Women — used in 1969 to label lesbian activists who were perceived as “a threat” and excluded from the feminist movement. Nearly fifty years later, a similar struggle for LGBTQ rights, protection, and equality persists in the United States and elsewhere. At least 16 states have considered “the bathroom bill,” legislation that would require people to use restrooms according to the gender they were assigned at birth, further complicating the everyday lives of transgender, gender-nonconforming, and genderqueer individuals who already face regular discrimination. Texas Lieutenant Governor Dan Patrick, who guides the legislative agenda in the predominantly Republican-state senate, said the measure protected the privacy and safety of civilians. To date, there has never been a single instance of a transgender person harassing anyone in a public restroom. As a matter of fact, a study from the Williams Institute reported that 70% of people in the survey who identify as transgender or gender non-conforming had experienced some sort of negative reaction when using a bathroom — including verbally threatened and ridiculed. For 9% of respondents, actual physical assault had occurred. Using queer-visibility slogans that she wrote and printed herself, Fegan planted the first posters in the dive bar she works at to bring these issues to light. Not everyone had something nice to say, however. But it didn’t stop Fegan from putting up more posters, and shortly after when somebody else spoke up and advocated on her behalf with their own scribbled notes, the poster in and of itself became a conversation piece. 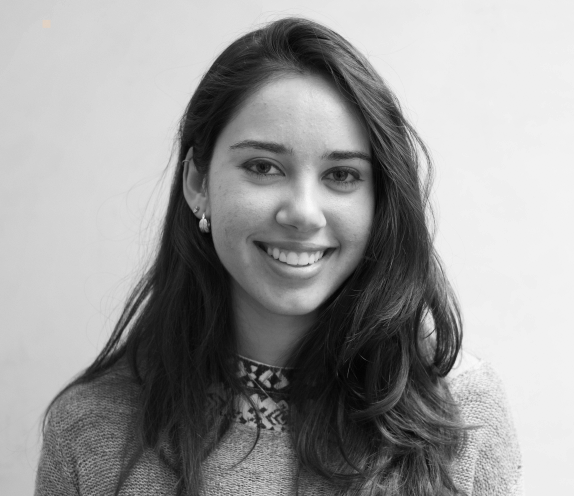 “I think it was odd that the poster that was the most positive, the most sensitive, was the one that elicited the most hostile reaction from the public,” she added. 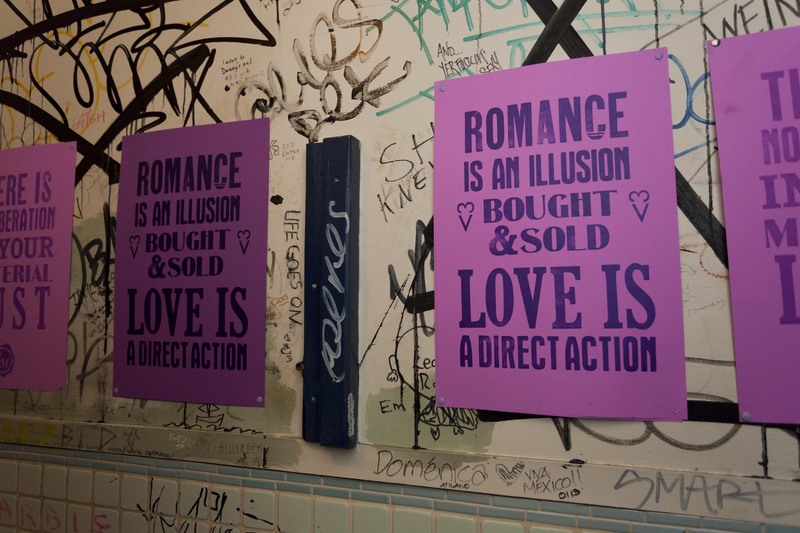 With a grant from The Propeller Fund, Fegan created more posters for events outside of what she calls her “bathroom interruptions,” including the Chicago Dyke in March of 2015. 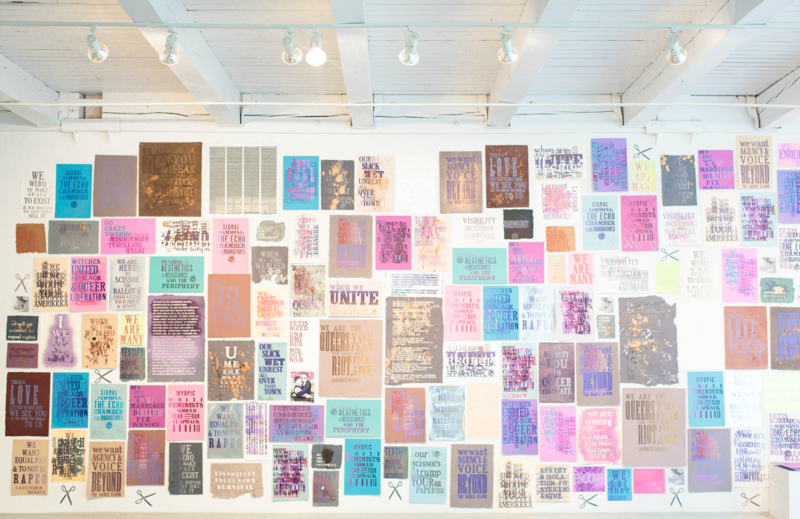 Since then, her posters have been used by admirers in women’s marches all over the country — including D.C., Chicago, Los Angeles, and Seattle. Her posters are not for sale though. If people want them, she gives them away. Otherwise, they’re usually taken from bathroom walls.